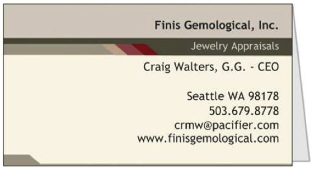 Finis Gemological, Inc. is the professional practice of Craig Walters. He has an extensive career in the jewelry industry. Additionally, he manufactures color grading sets used in fourteen countries, and presently offers onsite appraisals in a different city every day one hundred and sixty days per year. while enjoying the challenges of the field. Finis Gemological is unique in its appraisal services and they way they are delivered. Craig invites clients of Finis to interact with the process and offers ways to enrich the experience. That is why many continue to update their appraisals through this firm. Finis Gemological is solely owned and operated by Craig Walters. He is sponsored by major jewelry stores in the United States and offers appraisal services at their locations. Often, these are in conjunction with sales events. However, the appraisals are independent.